A fictional comedy starring femme top author Lesléa Newman, her beloved butch, Flash, and other grrls, guys and felines who live, work and play in Lesbianville, USA. Nothing is sacred to Lesléa Newman, dubbed the “lesbian Erma Bombeck” of our time, as she uses her pen and wit to chronicle the adventures of our dynamic dyke duo in such chapters as “A Femme Shops ’til Her Butch Drops”, “Have Femme, Will Travel”, “The Butch that I Marry”, and “Our pocketbooks, Ourselves”. 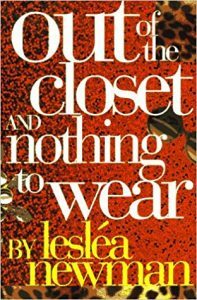 Shortlisted for the 1997 Small Press Book Awards (Gay and Lesbian category). from PMS: Please Menstruate Soon! Of all the joys of lesbian life, which are much too numerous to mention, there is one I would just as soon live without: the pleasure of two women living together, loving each other, and being PMS at the same time. It is not a pretty picture, believe me. Luckily I no longer have to worry about this Less-Than-Fabulous situation, because my beloved Flash has tapped into her ancient female wisdom and figured out how to never have her period again. Yes, Flash is the envy of all our Baby Boomer and Generation X friends: she has worked hard and achieved menopause. And it’s a good thing, too, as I have enough Pre-menstrual TENSION for both of us. And this is the beauty of being a lesbian: my lover has been through it all before. Only someone who has walked a mile in my mules (in swollen feet, no less) could possibly understand and put up with the monster I become for seven days out of every month. It is 3:00 a.m. Flash stumbles into the bathroom to find me squatting in the tub, stark naked, scrubbing the hem of the shower curtain with a brillo pad. “Why are you doing that now?” Flash asks, genuinely curious. “Because I can’t stand the shmutz in this house for one more minute,” I say, applying all the elbow grease I can muster. “Why don’t you come to bed?” Flash holds out her hand.” The dirt will still be there in the morning.” “Over my dead body,” I say, doubling my efforts. “Somebody’s PMS,” Flash sing-songs. “I am not PMS!” I shriek, throwing the brillo pad at Flash’s head. She ducks and goes back to bed, hoping she can get some sleep. She’ll need her strength: the fun has just begun.